Cymbidiums, also known as, boat orchids, are some of the easiest orchids to grow. They can withstand some winter chills (down to 29 degrees F) or summer heat (up to 100 degrees F) for short periods. Cymbidiums bloom from winter to spring and make ideal cut flowers as well as bouquet or corsage. Cymbidium flowers come in almost every color, except blue and true black. Also known as, Cymbidium Claude Pepper, Cymbidium Clarisse Pepper and Cymbidium Clarisse Austin, Rebecca has a reddish burgundy color. It has an inflorescence that consists of one bud and ten flowers. The flower has a matte texture. Its sepals and petals have cream base, with dark brick red overlay and burgundy striations. Both the margin and lip are cream-colored. The lip also has a band that is dark burgundy with cream edging. Each flower measures approximately 3 inches long by 1.5 inches wide. Rebecca is a prolific bloomer and emits a relatively strong fragrance. 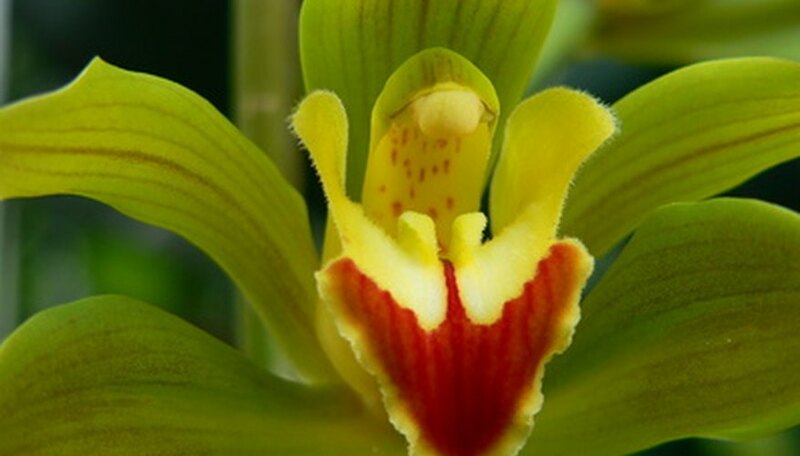 Northern cymbidium (Cymbidium madidum), also known as, Buttercup Orchid and Moist Forest Cymbidium, is green in color. Considered an epiphyte (dependent on other plants to grow) or lithophyte (can grow on rocks, deriving nutrients from the atmosphere), Northern Cymbidium orchid grows in the rain-forest or damp forests around Brisbane, Australia. You will find it growing in hollow limbs or tree stumps, as well as, on the ground. Each grass-like spike can grow up to 45 inches tall and up to 2 inches wide, appearing from the large pseudobulbs. Each stem measures up to 40 inches long and has an inflorescence of up to 70 flowers. Each flower measures approximately 1 inch across. Each green flower has yellowish lip with burgundy center. Cymbidium suave is also green in color and has stark similarities with Cymbidium madidum. The main difference is that C. suave has no pseudobulbs. Its grass-like leaves grow up to 30 inches long by 1 inch wide. Each flower stem measuring 15 inches long consists of up to 50 flowers. Each green flower measures up to 1.5 inch across with large purplish labellum (lip). C. suave is also very fragrant. Cymbidium ensifolium grows throughout Indochina, China, Japan, Borneo, New Guinea and the Philippines. Long-term cultivation of this specie has contributed to its widespread and distinct subtypes. C. ensifolium comes in a range of flower colors and shapes. This particular orchid will do well where other high-light orchids can grow; however, it is not a windowsill orchid nor will it thrive under direct lights. The stem produces inflorescences of up to eight flowers, each measuring from 2 to 3 inches across. The flowers bloom up to two to three weeks, which is relatively shorter than other cymbidiums. The color is often a mix of reddish brown and greenish background. The flowers are very fragrant and bloom in the late summer to early fall. An example of white cymbidium orchids is the Cymbidium Leodogran 'Snowy', which has an apple scented blossom with purplish-pink lip. The flowers measure approximately 2 inches across. Other white cymbidum orchids include, but not limited to, Cymbidium Olymilum 'White Elf', Cymbidium Egret 'Irelands', Cymbidium Cherilyn 'Swansea' and Cymbidium eburneum.